Attached please find the results of the Monday meeting. We are also looking to get a feed from Skip of Elizabeth on activities in Japan involving Russia. Hosono mentioned to Chuck that he may ask NRC to assist in cooperation efforts involving Russia in the not to distant future, so it would be good to know what activities they are involved in. The NISAJTEPCO meeting focused on plant status and discussions of the TEPCO “Roadmap towards Restoration from the Accident at Fukushima Daiichi Nuclear Power Station,” which is a high level guide discussing the big picture steps for bringing the reactors and spent fuel pools to a stable cooling condition, and mitigating the release of radioactive materials. This report was big news in the local media, some applauding TEPCO openly communicating their recovery plan, others criticizing TEPCO for planning to take nine months for their recovery plan. The meeting began with the RST lead stating the new team (which had changed out over the weekend) had reviewed all of the data and concurred with the previous team’s assessment that NRC believed more emphasis was needed on diversity and redundancy for the site cooling systems. Nei countered with a request that NRC provide him detail on exactly what measures and systems we were recommending. When asked about the level of activity on the site TEPCO provided there were 778 people directly at the site and 150 people at a staging are working support. This was a bit higher than the level of activity most expected. 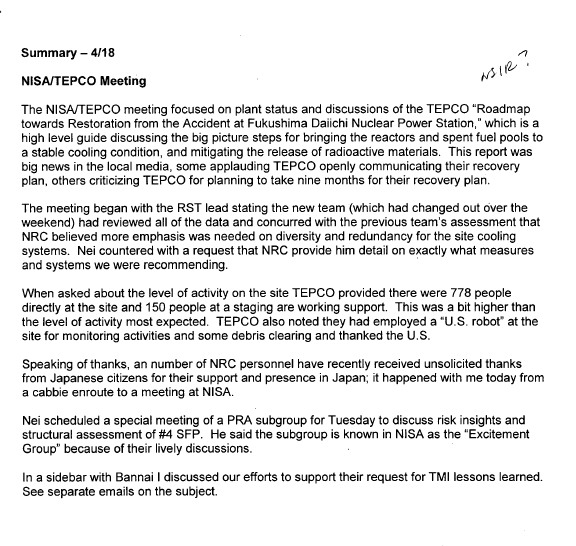 TEPCO also noted they had employed a “U.S. robot” at the site for monitoring activities and some debris clearing and thanked the U.S. Speaking of thanks, an number of NRC personnel have recently received unsolicited thanks from Japanese citizens for their support and presence in Japan; it happened with me today from a cabbie enroute to a meeting at NISA. Nei scheduled a special meeting of a PRA subgroup for Tuesday to discuss risk insights and structural assessment of #4 SFP. He said the subgroup is known in NISA as the “Excitement Group” because of their lively discussions.